I cant remember which but this is either an Atacama or Alphason rack. I think Alphason though. Cost £190 a few years back. It has 'cable management' in the back legs so your system can look nice and tidy. As you can see I dint cause im lazy! A couple of minor marks through every day wear and tear but nothing worth bothering about. Collection only from Kirkcaldy, Fife. 10 minutes drive from both Jordan Acoustics(Shadow Audio) and Audio Emotion! £50 and its yours. Ill even throw in a bowl of home made soup! 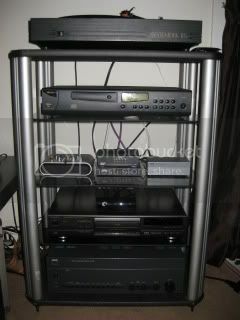 Source : Systemdek IIX into NAD PP2,Arcam Alpha 7SE, Acer laptop into Alesis io2 usb soundcard. Cables : Audioquest, QED, Cabletalk and Chord. Blu ray : Philips BDP3000 Just arrived!